News Flash! 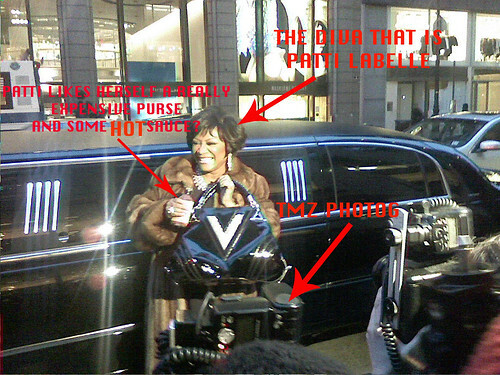 Patti LaBelle Loves Hot Bags and Hot Sauce! Ok, this is just a quick post to offer a quick laugh. Hey, it’s still food-related! On Tuesday of last week, we went to Barney’s (you know the high-end NYC store) to use a gift certificate we had received from our wedding last summer. Now, I’m sure you think we’re sooooo fabulous and chic and rich enough to shop at Barney’s regularly, but, um, hells no. Until Tuesday, I had never, ever been to Barney’s. If we even have a month where we can afford clothes, it’s H&M, Forever 21 (I’m very far from that, but believe me, I feel 55 when I try to shop there, but it’s cheap) or any other discount store. So, yes, Ms. LaBelle is coming out with her own line of hot sauces. She’s had cooking shows and has written other cook books in the past, mainly as a result of getting diabetes years ago. Check out this NY Times Article if you’d like to read more. I’ll hopefully get to check out this line of hot sauces and I’ll be able to report back on how they are. Hahahaha! I love Patti ad she’s a awesome cook and singer.I lived in Philly briefly while my mom was working on her doctorate at U of Penn. I feel you on the cheaper stores. There was time I could occasionaly shop at the high end stores. Because I’m in the biz I can still find some great deals or look forward to occasional genoristy of friends and family for Gift certificates, etc.Now I sometimes have to go to the H&M’s ane Forever 21( I can squeeze into a top or two, but dont try to wash that stuff and expect to wear it again). As a native New Yorker, I was taught never to acknowledge celebrities — to “give them their privacy”, as my parents used to say. We’d go to the theater and find Paul Newman sitting in front of us, or see Dudley Moore at the MoMA, or find Julie Christie shopping in the same store — and we’d just pretend this was no big deal. Times have changed! I love the shout-out to XXI. Now that they’re calling themselves that, glancing at the tag always looks like it says ‘XXL’, and then I cringe a little. Their leggings are so comfy, and only like $10! I’m so envious that celebrities can sell anything. I bet someone else formulated and tested hot sauces and just gave her three to choose from. Hey, all! As always, great comments. Courtney and Pixie – she’s fab! I think I have a girl crush on her. Lydia… you’re so right. Times really have changed. We checked out Patti just cause I like her, but normally I could care less about seeing celebs. I used to live in Soho and as I was rushing down the street in a stained shirt, workout pants and no makeup, I used to see lots of people (stars and those in Soho trying to pretend they are)… I just learned to not care about any of that stuff. But, patti was definitely asking for attention… maybe that’s the difference these days? Celebs actually want it all?